Henlopen Hotel patio (Rehoboth Beach): A favorite spot for sunrise photos. Boardwalk Plaza Hotel, Atlantic Sands or ResortQuest: View the sunrise over the horizon from the balcony of your room. Gordon’s Pond (Cape Henlopen State Park): Sunrise among the shorebirds is a moment to treasure. The Point (Cape Henlopen State Park). Walk out to the end of the Cape itself to catch a sunrise with lighthouses on the water and ferries gliding in and out of port. Bethany Beach: Grab a cup of coffee, head out to the beach and begin your day with a spectacular view. You can even enjoy Yoga at Sunrise Friday - Sunday at the bandstand from 6:00 a.m. - 7:00 a.m.
Rehoboth Beach Boardwalk: There is just something about the boardwalk at sunrise. The colors of the sky, the sounds of the ocean, you won&apos;t want to miss it. Sunset Park in Dewey Beach (end of Dagsworthy Avenue): This small park with a gazebo on the bay offers a view of sunsets and shorebirds, perfect for a relaxing evening moment. Fisherman’s Wharf in Lewes has Evening Cruises. Paddling into the sunset: The Delaware State Parks, Coastal Kayak, DelMarVa Board Sport Adventures and Quest Fitness and Kayak are just a few of the businesses that offer SUP and kayaking sunset tours in Delaware. 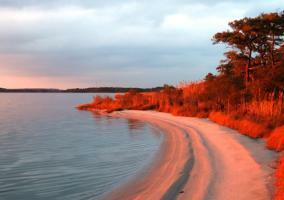 Quillen&apos;s Point (Cedar Neck): Catch the sunset light show over the Indian River Bay. Que Pasa: This Dewey Beach restaurant is a great place to catch the sunset over the bay. On the Rocks: Enjoy a drink on the dock and the view of the Cape May Lewes Ferry as the day comes to a close. 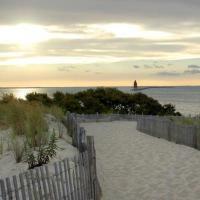 Fenwick Island State Park/Little Assawoman Bay: Spend a relaxing evening on the bay. The stretch of Delaware 1 between Dewey Beach and Bethany Beach offers great views of both the ocean and bay. A favorite spot for sunrise and sunset shots is Delaware Seashore State Park, especially around the Indian River Lifesaving Station for sunrises and along Tower Road (Bayside) for sunsets. From traditional cuisine to a unique twist on the most important meal of the day, discover the top brunch spots in Delaware.